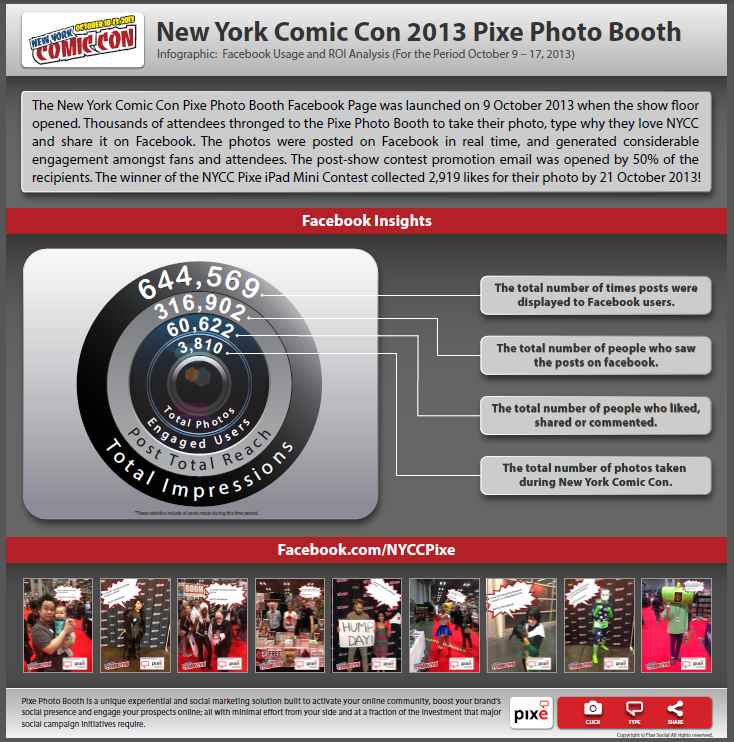 Pixe LLC, the Maryland-based social marketing solution provider, announces the release of the New York Comic Con (NYCC) Pixe Photo Booth Facebook ROI Analysis Infographic. The Pixe powered experiential and social Photo Booth engaged the fans and attendees of 2013 New York Comic Con extended the viral reach of the brand to more than 300K people on Facebook. The 3,810 photos shared from the NYCC Pixe Photo Booth were viewed by 316,902 people a total of 644,569 times on Facebook between the period October 9-17, 2013. In addition, 60,622 unique people liked, shared and commented on the photos, extending the NYCC's Facebook reach exponentially. oor opened. Thousands of attendees visited the NYCC Pixe Photo Booth to take their photo, type why they love NYCC and share it on Facebook in real-time. The photos generated considerable engagement among the enthusiastic onsite and online fans of the popular event, as is evident from the infographic posted below. The winner of the NYCC Pixe Photo Booth Contest won a complimentary iPad mini for collecting 2,919 likes for their photo on Facebook by 21 October 2013! Pixe LLC is a Maryland-based start-up providing turnkey social marketing solutions that is on a mission to take the challenge out of social media marketing by converting audiences into brand ambassadors. Launched in April 2013, Pixe has powered photo booths for a number of leading brands including Cracker Barrel, Porsche Club of America and Six Flags Magic Kingdom.